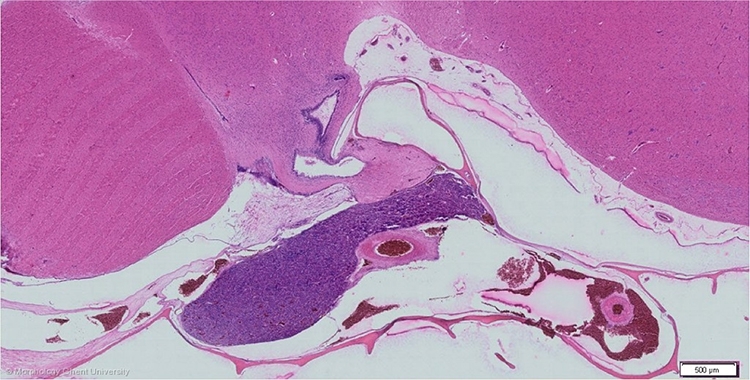 The adenohypophysis derives from the pharyngeal epithelium (Rathkeâ€™s pouch) and consists of a pars distalis or anterior lobe (lobus anterior) and a pars tuberalis. A pars intermedia is lacking. The adenohypophysis of a chicken, duck and goose has an elongated shape, whereas in a pigeon it is more compressed and rounded.